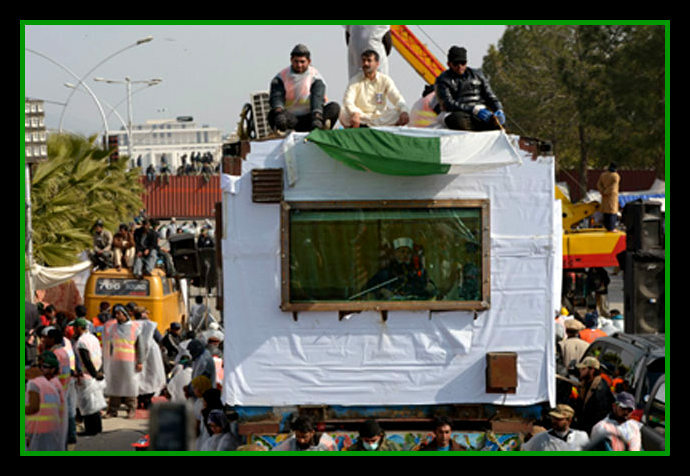 The bullet proof, bomb-proof, container-led revolution of Dr Tahir-ul-Qadri has concluded, thankfully without any loss of human life, but needs some reflection on its course, its aims and results. Dr Tahir-ul-Qadri claimed to bring an overnight revolution because people are sick of current corrupt system. The idea seemed fascinating but the problem remained that the concept of changing the system from outside didn’t fascinate many. Unless there is a strong urge of change from within, no one from outside can impose a change. No matter how catchy the slogans are, people don’t bother if they don’t feel an attachment towards it. When he quoted people like Imam Khumeni who were abroad and came back for revolution, he simply forgot to have a look at his popularity and credibility back home. Also, even in exile, Imam Khumeni was actively leading the movement. Nation would always be sceptical about someone who disappeared for good five years and came back to munch away a fruit which has been ripened with a struggle and misery of years. The tag of support of establishment/hidden hand also proved detrimental for Qadri saheb. His demands and agenda had nothing new and people doubted his real agenda. A lot has been shared and said about the personal record of credibility of Dr Tahir-ul-Qadri. It’s in bad taste to do character assassination; but still it’s a reality that character of a leader does matter towards his words, slogans and ultimately leadership. Commitment of a leader towards his cause is also very important. Security might be a burning issue, but revolutions don’t come in containers. Also, Qadri took several U-turns from his initial stance and virtually he had to end up with a face-saving agreement. He clearly failed to give a clear vision to his followers and didn’t tell them what the real goal was. People stayed in confusion and lacked proper direction. They still might not know what they were out for in biting cold for 4 nights while the leader and his family stayed in a heated room throughout. The role of media is disgraceful in this entire situation. Pakistan media lacks direction, professionalism and ethics This revolution drama got passionate coverage further confusing the nation. People were ‘captivated’ for 5 days and entire media was hijacked by the long march but no clear picture was shown to the country. Sensationalism was at its peak which is ruining the society by creating hypes out of nothing, wasting time, nerves and energies. But few exceptions can be seen, where journalists were very clear in their stance and gave remarkable analysis of the long march. Thousands of people spent 5 nights in cold weather of Islamabad without proper arrangements and the crowd comprised of people from all walks of life. It signifies that supporters of Dr Qadri, no matter what their number was, were committed to the cause. They were blindly following their leader which is another problem in Pakistan; blind following and no questioning of the leader even if it leads to a blind well. The followers of Qadri sb didn’t listen to any dissenting opinion and they still claim victory despite the fact that they have virtually achieved nothing. Again, it is very important that what shape we want to give to our movement. If someone compares himself to Hazrat Imam Hussain (RA) and then shamelessly goes and bows down to those whom he calls yazeedis, nation is simply not going to forgive him. Dr. Qadri was very vocal in calling people names and swearing a lot of times; but all this was actually weakening his cause. This long march indicated a ray of hope that people are willing to bring change but shallow slogans and inappropriate leadership is the biggest hurdle. Specific goals, thoroughly chalked out agenda and committed leadership is required to bring people back on streets. Also, a lot of people still believe in democratic process and are willing to give it one last chance. If the upcoming elections are rigged and same corrupt politicians appear, we could see the entire episode of long march repeated with much more enthusiasm and probably that will be the final blow to the current system. So following conclusions can be derived safely from the entire episode. The character of leader is of prime importance. Establishment always misused used the slogan of religious emotionalism and/or political corruption to intervene but now majority of people think , we’ve had enough of boots. Media can be manipulated by creating a drama with huge funds, but the impact of media is not the final blow. Muhammad Saad Khan is a Biomedical Engineer with a diverse background of engineering and management. 1) Dr. Qadri’s character and leadership is trusted by people of all walks of life and profession across the world but not all the people of Pakistan actually knew who he was or about his life work, therefore they were suspicious. 2) It seems (at least from my observation) that there is widespread inertia amongst people in almost all situations worldwide when it comes to initiating change that would benefit them and typically it is only a fraction of people that mobilize into action (or even come out to vote). The rest of the population observe on the sidelines and either silently support or criticize the initiative. Part of the problem relates to the ineffectuality people feel against entrenched systems so they try to make the best out of what they already have (i.e. carry on with corrupt elections) rather than risk trying something new (and many Pakistani voters actually echoed this sentiment). 3) Dr. Qadri’s agenda was always the same throughout from beginning to now – that you cannot expect to have a good outcome from a corrupt process/system and he cited chapter and verse (and law, both parliamentary and Islamic) on this point. 4) You would have to imagine that now the entire nation of Pakistan (not to mention the world stage) is aware of Dr. Qadri’s (charitable) work and also the way the parliamentary system is actually set up and used in Pakistan. This was a great education for the people and they will not go forward with closed eyes. And while some people can sit back from the perspective of writing a article, compared to the MASSIVE efforts and work of Dr. Qadri and his supporters, and say nothing was achieved – this is not true. This was a season of planting…and the outcome is yet to manifest. However, I do agree very much that the media both within Pakistan and internationally was a complete farce (with multiple errors from one news item to the next) and the amount of vile and slandering writing that emerged was absolutely shocking, even to myself. Thank you for this interesting website.